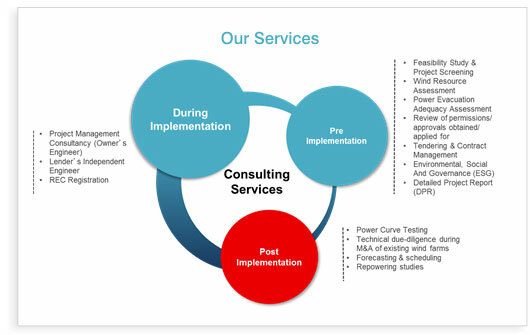 WinDForce Management Services Pvt Ltd (WFMS) works with public and private sector institutions to deliver services towards development of windfarms that are high performance projects and are set up in accordance with international standards with a capability to yield high returns to clients and investors. Currently, we have consultancy experience of more than 5000 MW wind projects across various countries. WFMS is managed by professionals having more than 200+ man years of experience in wind energy development. The team has very strong credentials and knowledge-base on wind energy, wind industry; wind prospecting, measurements and resource assessment, contracting, policy & regulations, power purchase agreements (PPAs), project management and technologies. WFMS uses State-of-the-art tools and techniques for wind farm design and assessment of Annual Energy Production. WFMS also provides other services for windfarm development viz., project structuring and financing facilitation, innovative electricity off-take arrangements, technical due diligence of existing wind farms, Owner's Engineer during implementation and O&M phase of the wind project. The WinDForce managment team comprises of professionals committed to Wind Energy Development and are highly qualified and experienced in their respective fields.